I dont know how to insert the file in to elo stat can someone help! Mode 1 is the standard mode of ELOStat. After choosing this point, three input parameters are expected from the user (represented boldface in the following). In the first line the name of the PGN file must be given (without PGN ending!). As an example a winboard database of Frank Quisinky, Kai Skibbe and Christian Koch was used here. It is not necessary that the database is in the same directory than the ELOStat program. But in this case the complete path to the PGN-file must be given, e.g. ‘c:\chess\data\wb_elo’. Long filenames are supported. 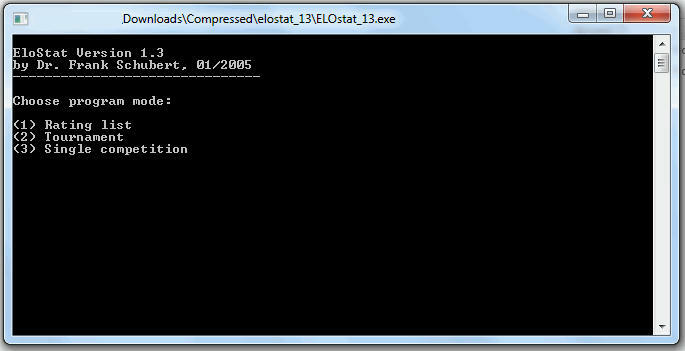 If ELOStat cannot find the database specified by the user, an error message is given. In the second input line from above the user can choose the start value of the Elo calculation. ELOStat uses the iteration algorithm introduced by Ken Thompson. For this, all programs start with the same Elo value (which means that all Elo values given in the PGN header of each game are not taken into account !). After that the whole database is treated as a single huge tourna-ment and the Elo performances of each program are calculated according to ELO’s formula. These new Elo values replace the start values. This procedure is repeated until all Elo values remain nearly constant (they are converging to a certain limit). The Elo start value doesn’t influence the relative playing strengths of the programs. Therefore the Elo differences between the programs are independent of the start value. The latter allows an absolute calibration of a rating list if appropriate results are available. How such a calibration can be carried out is desribed below. In the present example an Elo start value of 2400 was used. The third input parameter from above describes the minimum number of games a program must have been played in order to appear in the rating list. The standard value is zero (0) as given in the present example. Then all programs appear in the rating list. In some cases it can be necessary to exclude programs with only a few number of games (e.g. 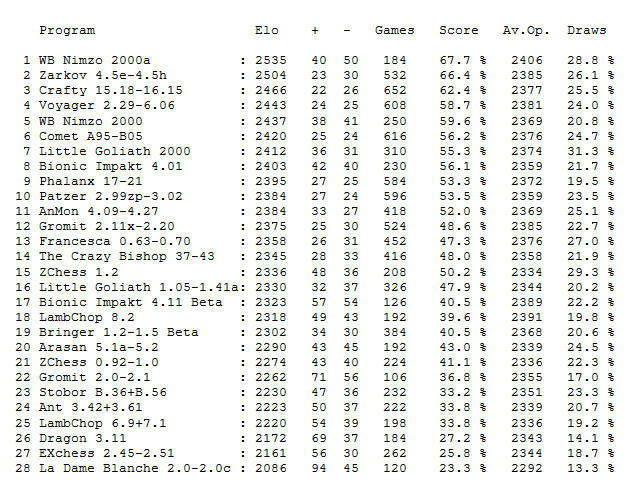 N < 10) because of their very uncertain Elo rating. If for example all programs with less than 10 games should not appear in the rating list, the user has to choose ‘10’ as input parameter instead of ‘0’ as used above. Note that this parameter only influences the outward appearance of the rating list. The statistical calculations including the iteration procedure are not concerned. In particular, all games of the excluded programs are still used to calculate the performances of the other programs. After entering the third input parameter, the PGN database is readed and the Elo calculation is started.